Amazon.com description: Product Description: A volume in CILVR Series on Latent Variable Methodology Series Editor: Gregory R. Hancock, University of Maryland The significance that practitioners are placing on the use of multilevel models is undeniable as researchers want to both accurately partition variance stemming from complex sampling designs and understand relations within and between variables describing the hierarchical levels of these nested data structures. Simply scan the applied literature and one can see evidence of this trend by noticing the number of articles adopting multilevel models as their primary modeling framework. Helping to drive the popularity of their use, governmental funding agencies continue to advocate the use of multilevel models as part of a comprehensive analytic strategy for conducting rigorous and relevant research to improve our nation's education system. 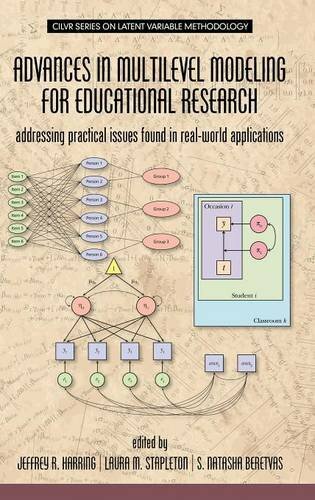 Advances in Multilevel Modeling for Educational Research: Addressing Practical Issues Found in Real-World Applications is a resource intended for advanced graduate students, faculty and/or researchers interested in multilevel data analysis, especially in education, social and behavioral sciences. The chapters are written by prominent methodological researchers across diverse research domains such as educational statistics, quantitative psychology, and psychometrics. Each chapter exposes the reader to some of the latest methodological innovations, refinements and state-of-the-art developments and perspectives in the analysis of multilevel data including current best practices of standard techniques. We believe this volume will be particularly appealing to researchers in domains including but not limited to: educational policy and administration, educational psychology including school psychology and special education, and clinical psychology. In fact, we believe this volume will be a desirable resource for any research area that uses hierarchically-nested data. The book will likely be attractive to applied and methodological researchers in several professional organizations such as the American Educational Research Association (AERA), the American Psychological Association (APA), the American Psychological Society (APS), the Society for Research on Educational Effectiveness (SREE), and other related organizations.